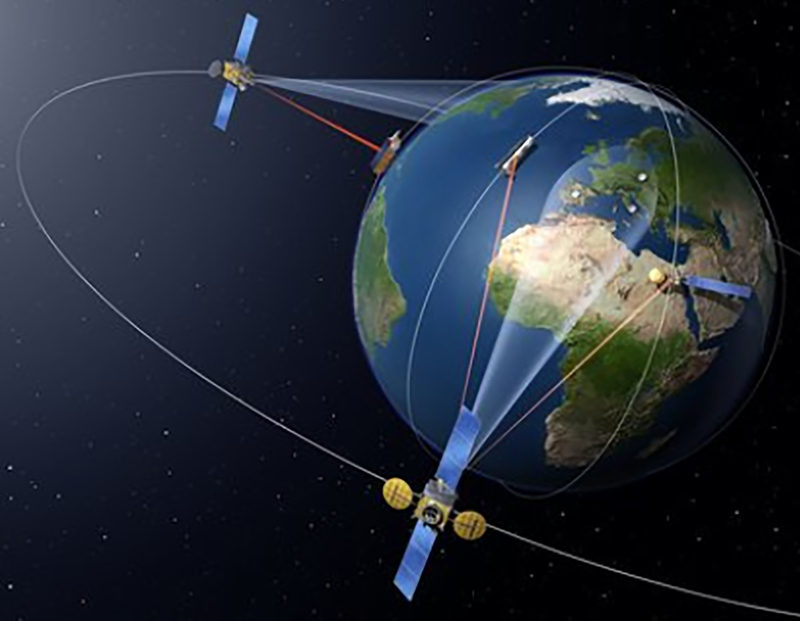 Artist’s concept of EDRS, courtesy of ESA. As 2014 commences, Moore’s Law is alive and kicking. This has significant implications for the design of Earth-observation satellites, and by extensions,for the geospatial community, which exploits the data which they collect. Because of Moore’s Law, the satellite hardware required to provide geospatial data is getting smaller and cheaper. This is a consequence of developments in terrestrial components, which are now being incorporated into “on orbit” designs. Data products which previously required a “mainframe” satellite can now be supplied by one of the “laptops” of space, and this has made commercial remote sensing an increasingly viable market. This trend will continue, as larger satellite memories,more on-board processing, and faster downlink data rates result in increased satellite duty cycles and hence a better return on investment. More importantly, perhaps, the decreasing costs associated with individual satellites mean that constellations incorporating multiple missions are now an affordable proposition. This clearly results in both significantly greater area coverage rates and much shorter revisit opportunities. Hence, change detection products comparing a given scene with an image of the same location taken the day before (rather than two weeks before), are now routinely possible. 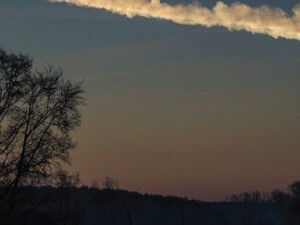 Historically, much of the Earth observation that has been performed from low Earth orbit (LEO) has been targeted at the land domain. However, a quick look at an atlas will convince most people that our planet is mis-named—it should be called “Ocean,” not “Earth”—since more than two thirds of the surface is covered by water. Due to the mobile nature of many maritime targets, satellite surveillance of the ocean clearly has to provide an up-to-date picture. The ongoing improvements to constellation technology mean that observation of the maritime domain can now be conducted in a relevant timeframe. This will become even easier in the future. 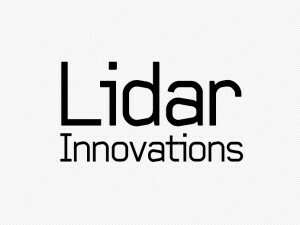 As commercial data-relay services from geostationary satellites such as the European Data Relay Satellite (EDRS), become a reality, LEO observation missions will be able to return their data in near-real-time. See Figure 1 above. The design of a satellite optimised for maritime surveillance is subtly different from one intended for surveillance of the land. It will typically have wider swath sensors, of course; but some of the expected applications such as bathymetry also call for data collection in different spectral bands to allow the discrimination of bottom type; and the need for ship detection implies a greater emphasis on the near- infra-red, a band in which the contrast between the ocean surface and the ships is enhanced, improving the probability of detection. These two Executive Viewpoints contain opinions of the authors, not their respective companies. Future missions are also expected to break out of the historical pattern of stove-piped satellites carrying just one class of sensor. It is likely that these future constellations will incorporate “ears” as well as “eyes.” Satellites in LEO are already incorporating receivers for the Automatic Identification System (AIS), a mandatory radio-frequency (RF) system designed to enhance the safety of maritime navigation. Combining the output of such RF receivers with the data from imaging sensors opens up interesting possibilities. Pursuing this analogy, human beings who lack their sense of sight or hearing are generally considered handicapped, and it is likely that our current satellite missions will be regarded similarly in a decade or two. Developments in the processing and dissemination domains will be required to exploit these very timely data streams. Correlating the position of a ship in an image with its AIS-derived location is not entirely straightforward. However, it offers enormous potential for differentiating between legal shipping and any unwise vessels with criminal intent which fail to recognise that the “high seas” have ceased to be an unobserved and hence unpoliced domain. It has been calculated that 90% of world commerce moves by sea, and hence there is a global commercial interest in keeping track of movements in the ocean. The problems caused in the maritime domain by illegal fishing, maritime pollution, drug smuggling, illegal immigration, piracy, etc. will only be addressed if there is improved surveillance of the oceans. Move over geospatial, here comes hydrospatial. Since the early days of space-based remote sensing for land applications, there have been efforts by governments, particularly the U.S. government, to commercialize Earth observation programs. These efforts have been met with varying degrees of success and have resulted in significant uncertainties around the long-term sustainability and continuity of remote sensing data. Today, there are four main trends bringing change to the industry, and opportunities for access to space-based remote sensing data, in a more commoditized way. These trends are facilitating the transition toward commercialisation that was envisioned in those early days. order now Firstly, improved low-cost satellites reduce Earth observation space segments costs, which in turn reduce the corresponding data costs. visit website Secondly, constellations facilitating high revisit rates are becoming more commonplace. This is partially due to the fact that the Earth observation industry is becoming more creative in forming constellations. Traditionally, constellations were formed either through government and industry cooperation (e.g., DMC), or through big programs that funded the entire constellation (e.g. 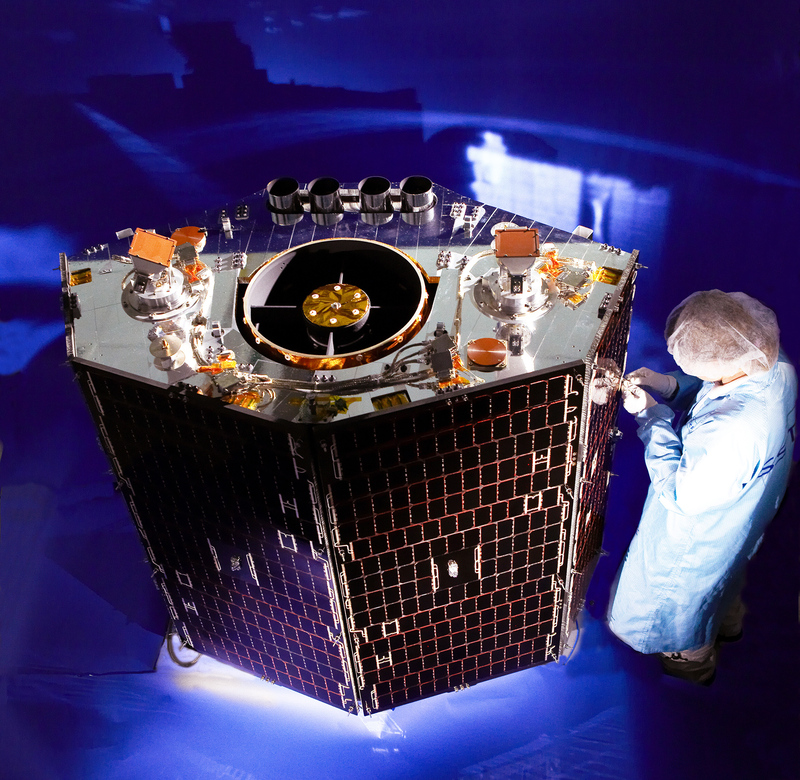 RapidEye and the upcoming Radarsat Constellation Mission). These models will carry on with continued success; however, innovative ways of assembling constellations are coming about. For example, satellites are no longer financially prohibitive for commercial entities wishing to procure a satellite for their own imaging needs and to offer it as part of a constellation along with satellites owned by various industrial partners. Alternatively, there is a trend toward satellite capacity sharing (e.g., NovaSAR), creating an opportunity for a larger stake-holder base that can spread the costs of commercial constellations. https://stetsonpainting.com/whychooseus/ order now Thirdly, access points are being created to consolidate data from many sources in various innovative ways in support of a range of user types. In some cases, governments are initiating their own portals for access to geospatial data, including remote sensing data. This type of initiative has been very successful in the Netherlands and in particular in Australia, where the government is making data available to all government users on open licenses as part of a ‘Data Commons’ concept. Further to governmental initiatives, intergovernmental access points are linking wider groups of users to various datasets (e.g. GEOSS data portal). Commercial data providers and distributors are also providing access points to consolidated data offerings. 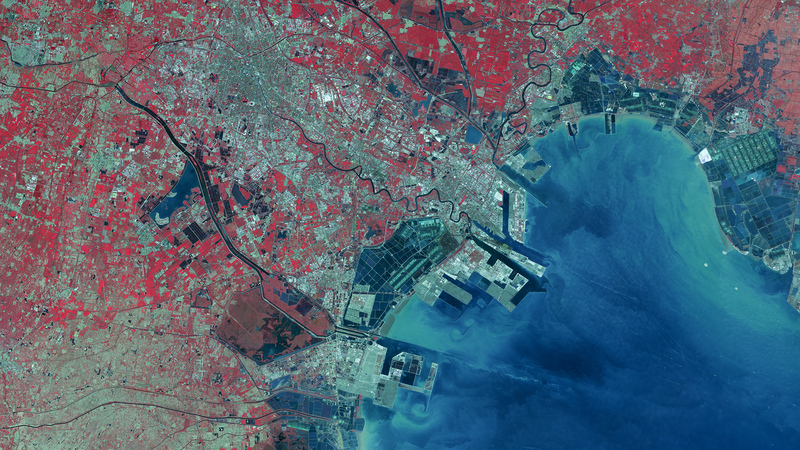 DMCii, for example, will soon be a one-stop-shop for a wider range of data products, including very high-resolution multispectral data and S-band SAR data, alongside its flagship 22-m multispectral data product. Through this growing constellation, DMCii is itself growing with a wider offering of rapid access to low-cost, high-quality data products. Access points to data are also allowing buyers to select their particular areas of interest, rather than procuring full scenes. This is a leap forward in improving data processing times. 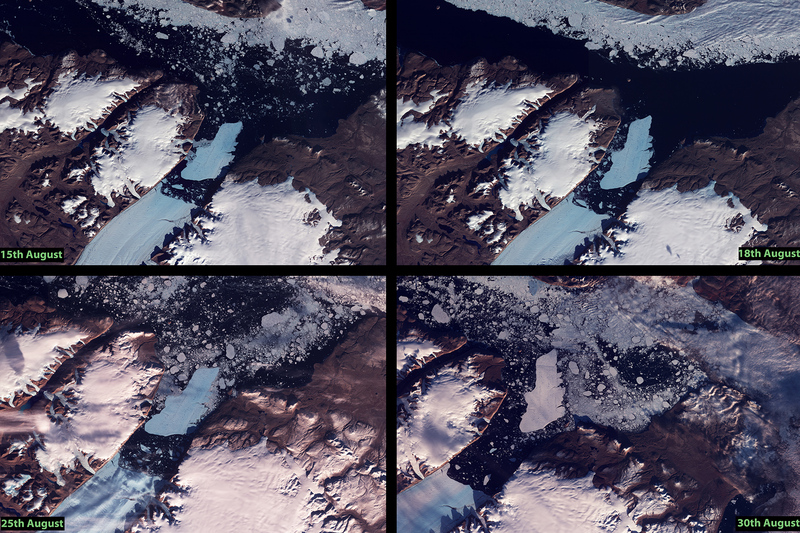 Melting of Petermann Glacier, Greenland, during August of 2010, taken with the UK-DMC2 satellite. Image of harbour in Binhai, Tianjin, China acquired Oct. 2, 2013, courtesy of DMCii. viagra no prescription Fourthly, cloud computing is at the forefront for facilitating the development of and access to Earth observation applications and data. The basic principle applied for applications development is that the cloud can be used to bring developers to the data rather than bringing data to the developers. This concept is expected to spur applications development by reducing developers’ software and storage infrastructure overheads. Advances in cloud computing should give a wider community access to remote sensing data and facilities in order to advance cutting edge applications development. Yes, these trends are changing the industry but, of course, major government initiatives (e.g. GMES,Landsat) will continue to provide baseline datasets, which are particularly useful to applications developers and academics. These programs however do not, and will not, support the service level requirements of commercial service providers that will draw on remote sensing data. These requirements for higher service level will be handily met by data providers who are well positioned to offer the rapid revisit times needs for commercial services. My suggestion is that you watch this space. Exciting times are ahead where better access to consolidated, cheaper data will spur all sorts of services that will draw on space-based Earth observation data. NigeriaSat-2 satellite, built by SSTL. Bush fires in Woomargama National Park, New South Wales, Australia, Jan. 22, 2014, courtesy of DMC International Imaging. Esri’s main technology platform, ArcGIS, has evolved over the last decade into a comprehensive imagery system. It includes access to global, multispectral, and multi-temporal imagery; pro- vides advanced imagery management capabilities; and has hundreds of built-in imagery processing and analysis tools. ArcGIS works with almost every sensor and data format, and is supported on almost every application, device and plat- form. 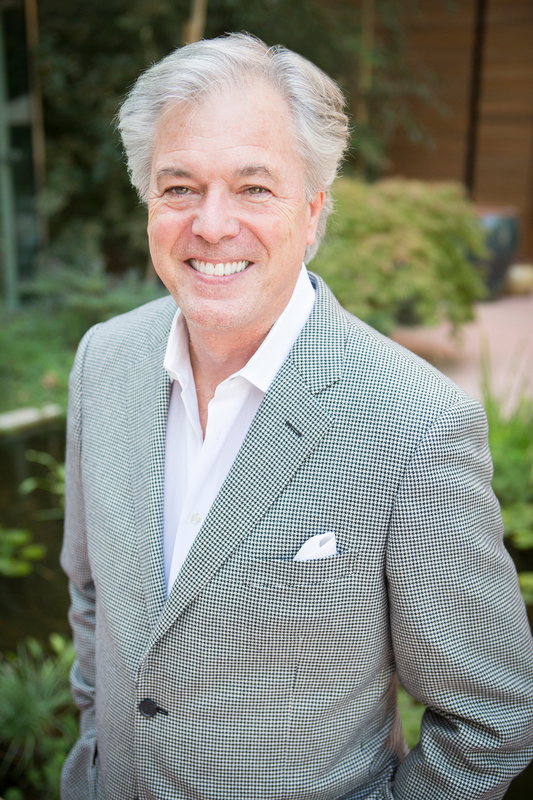 Our vision for 2014 is to continue to lead the industry with technology that makes it easier for our customers to use imagery for better comprehension of their environment. With the vast amount and variety of sources collecting imagery, the problem has shifted from acquiring imagery to being able to quickly discover and use the appropriate imagery for a project. Esri has been actively engaging customers, partners and imagery data providers to understand the different types of imagery required and how people want to use imagery. We’ve taken that knowledge and over the last six years, significantly increased the amount of imagery available over the cloud through ArcGIS Online. This includes imagery managed / curated by Esri, such as our World Imagery basemaps, dynamic Landsat 8, Landsat GLS and elevation image services. This makes the world’s imagery accessible to everyone, with easy integration of imagery into Web maps and applications, desktop tools, and mobile platforms. Imagery data providers are also looking for easy ways to manage and make their imagery accessible, and they have adopted the ArcGIS platform. ArcGIS makes it easy to manage imagery, from single scenes to the largest collections. Several imagery providers have standardized on ArcGIS as a management platform for their imagery, while others are coupling that with access to their imagery through our ArcGIS Online cloud. 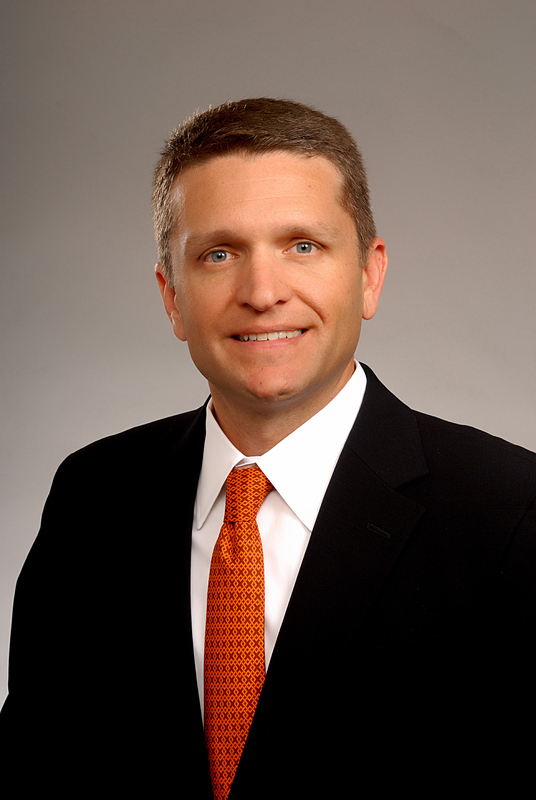 As we move forward in 2014, we will continue to evolve our technology to help our customers achieve their goals. Expect to see even more imagery available through ArcGIS Online, additional Web applications and templates, and tools that further simplify image analysis and processing. We believe that the future belongs to the simple and the quick, and our vision is to transform the work required to complete complicated tasks into a process that is easier to use and intuitive. As we begin year 2014, its important to examine how the geospatial industry has evolved not only in the past year but in the last several years in addition to how the industry will likely evolve in the years to come. I’ll start by discussing why the development of commercial Earth-imaging satellites has been one of the most important advancements in the geospatial industry. 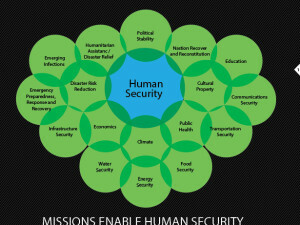 Geospatial technology using Earth-imaging satellites has reshaped our view of the world, improving national security, logistics and navigation, mapping, natural disaster tracking and transparency in human rights issues. With highly accurate cameras on satellites orbiting the Earth, the commercial Earth-imaging business grew out of Cold War military applications for reconnaissance missions that photographed classified military installations. 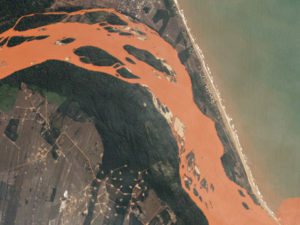 Today, high-resolution imagery from commercial satellites serves worldwide demand for measuring and monitoring the Earth for security, emergency response, environmental assessment, natural resources, real estate, agriculture and news reporting purposes. 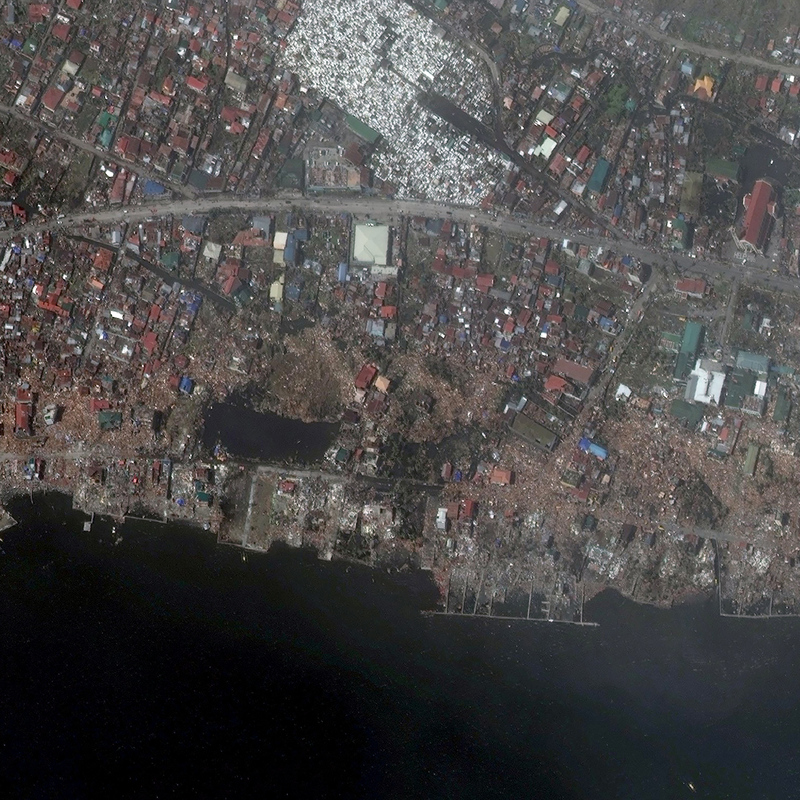 DigitalGlobe has a long history of providing imagery for disasters and crises across the globe, ranging from war crimes in the Sudans, to the recent flooding devastation in Colorado, to the typhoon in the Philippines (see Figures 1-2). 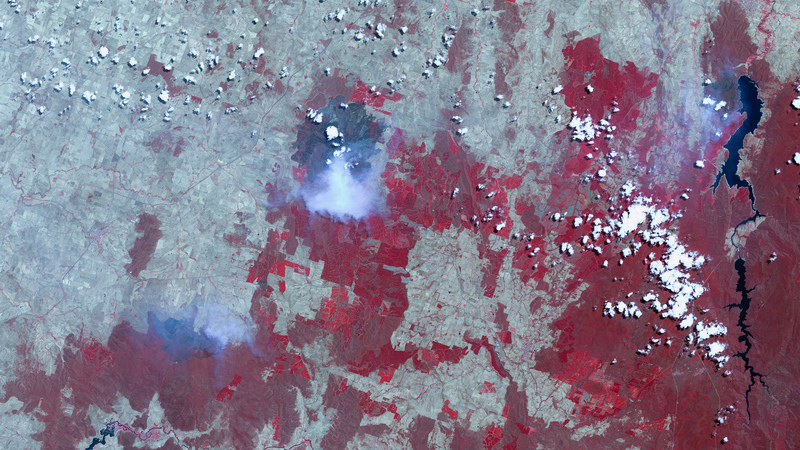 Ultimately, imagery from commercial satellites helps protect and improve the lives of millions of people every day. 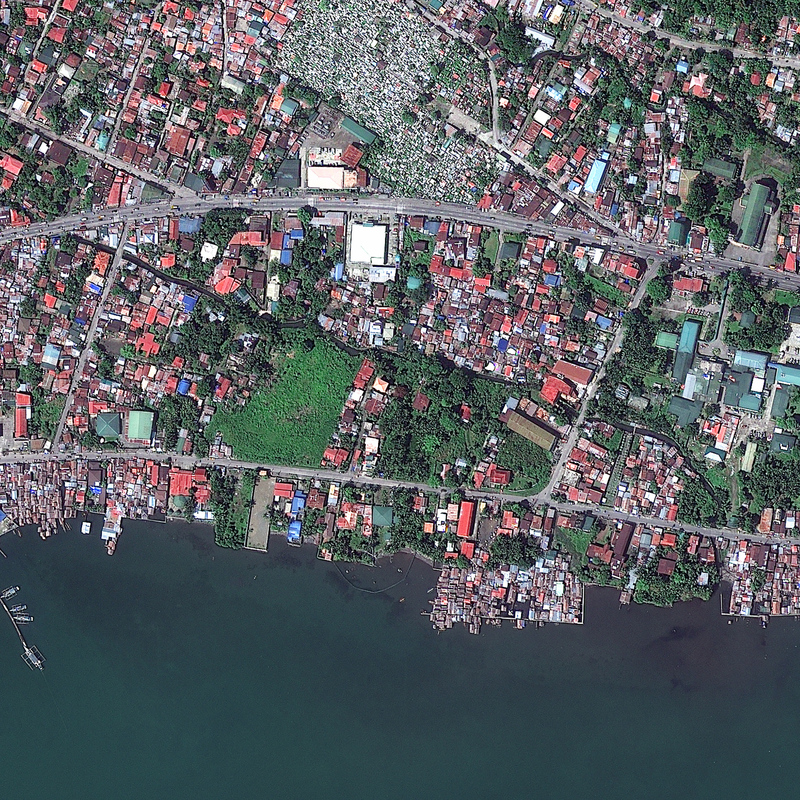 Before the typhoon: Tacloban City, Philippines, captured Feb. 23, 2012, courtesy of DigitalGlobe. After further examining the history of the geospatial industry, we’ve been most surprised by the advancement of geospatial analytics, which turns images into answers using the data from commercial satellites. Many assume that DigitalGlobe and other satellite providers have automated tools to search through the massive number of images taken each day by satellites circling the Earth, but that’s not quite the case yet. It still comes down to the people and the analysts to identify what’s most important and to provide context and insight to satellite imagery. Insight provided by combining imagery, geospatial analytics and all-source intelligence can make a significant difference in evacuation planning, disaster response and recovery, and change management worldwide. These enhanced geospatial analytics capabilities have enabled DigitalGlobe to routinely develop predictive analytics models that process hundreds of layers of geospatial data to identify the physical, cultural, and social factors that can assist various military, intelligence, and law enforcement activities. Understanding the geospatial factors that correlate with nefarious activity allows our customers to put their resources in the right place at the right time. Now, as crowdsourcing comes of age, it reinforces what has always been true: the power of people makes the ultimate difference. With the acquisition of Tomnod, Inc., a geospatial crowdsourced intelligence pioneer, we’re able to add crowdsourcing analysis and deliver even more value to customers—at great speed. This has enabled DigitalGlobe to take another step in moving beyond providing only raw data to now being able to deliver insight and analysis that can be integrated with the imagery. As we look ahead to year 2020, we realize the geospatial industry may not exist as we currently know it with primarily location-based information and imagery, but it will exist in some form and will have grown significantly. Geospatial technology will likely be focused on managing the massive amount of data that’s too difficult to process using on-hand database management tools or traditional data processing applications. The ongoing challenges over the next several years will most likely include capturing, curating, storing, searching, sharing, transferring, analyzing and visualizing geospatial big data. The large and complex data will demand cost- effective, innovative forms of information processing for enhanced insight and decision making. DigitalGlobe is equipped with the expertise and enabling technologies required to process and exploit geospatial big data. This allows us to quickly discover patterns that may exist across hundreds of layers of spatial data and then process that data on the fly to deliver timely insights. We plan to continue extracting information from our imagery to solve some of the greatest challenges that our government and commercial customers will face in the years to come. By 2020, DigitalGlobe aspires to be the indispensable source of information about our changing planet. We expect to manage a living digital inventory of information about the surface of the Earth, and our customers and users will be able to reach into that living inventory and ask a discrete question about the Earth and the answer they need. We don’t believe our customers will need a degree or background in GIS or mapping but instead will be responsible for making decisions tied to a place on the Earth’s surface and managing change of that place.